=►Grind together all ingredients with 1/4 cup of water and salt. =►Pour grinded paste into a bowl and heat 1tsp of oil in a pan. 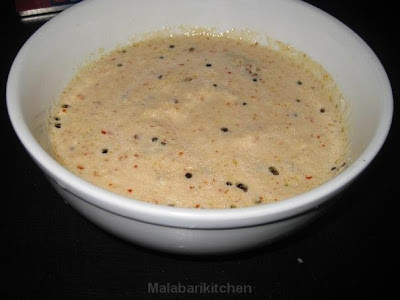 =►Put mustard, fenugreek, dry red chilly and curry leaves and pour this mixture into above grinded paste. Note: If u want it more liquid add more water. Yummy coconut chutney,my fav with dosa.